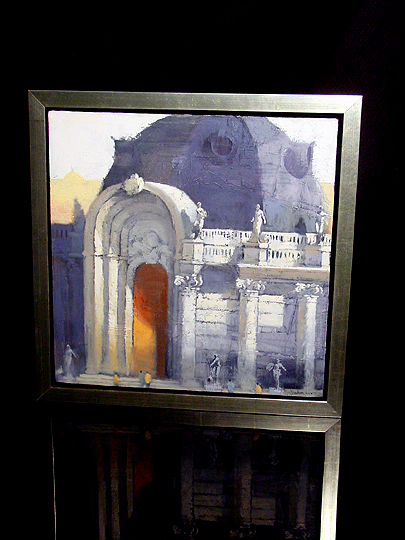 OIL ON CANVAS, 20" BY 20"
The subject of this work is a building which is primarily based on the Petit Palais in Paris. The Petit Palais and its neighbor the Grand Palais were built as exhibition halls for the Paris Universal Exhibition of 1900; they both demonstrate quite well the flamboyant art nouveau architecture that flourished in Paris at that time. There are a few things about this work that I really like. When I was growing up, I always wanted to be an architect, so the architectural nature of this work appeals to me. Also, I really like the scale of this building... you can see from the people in the painting that the building, the arch, the doors themselves are all HUGE. The doors are also very cool... the way the color of the doors contrasts with the largely monochromatic stonework and roof is very nice. When I met him, Paul told me that this work has more texture than a typical work of his... the reason for this is that this canvas was previously used for a different painting which Paul thought just didn't come out right. So, he rotated the canvas 90 degrees and painted over it. Although you probably can't see it here, the work has some texture which clearly outlines the location of the arch that's behind the work. I think this is pretty neat.